Most Star Wars fans are likely looking forward to Rogue One: A Star Wars Story, the second Star Wars film of the Disney era after J.J. Abrams’ The Force Awakens ended up being a massive hit last year. Star director Abrams won’t be returning for this latest Star Wars film however, and Rogue One itself is not a direct sequel to 2015’s The Force Awakens, but a spin-off movie taking place before the events of the original Star Wars movie which came out in 1977. One can still feel the Force in the movie’s latest trailer, though, as it looks like director Gareth Edwards’ picture nails the Star Wars atmosphere and also features the series’ most iconic villain to date, Darth Vader. But it’s likely we won’t see many Jedis or lightsabers in Rogue One, as the movie focuses on a group of rebels led by Jyn Erso (Felicity Jones) who are attempting to steal the plans for the Death Star, the Empire’s iconic superweapon which Luke Skywalker famously blew up in the first Star Wars movie. It is clear that Rogue One has a pretty great cast too, including actress Felicity Jones who plays the leading role, Oscar winner Forest Whittaker as a resistance fighter and Danish actor Mads Mikkelsen, who caused a great impression back in 2006 in the James Bond movie Casino Royale. 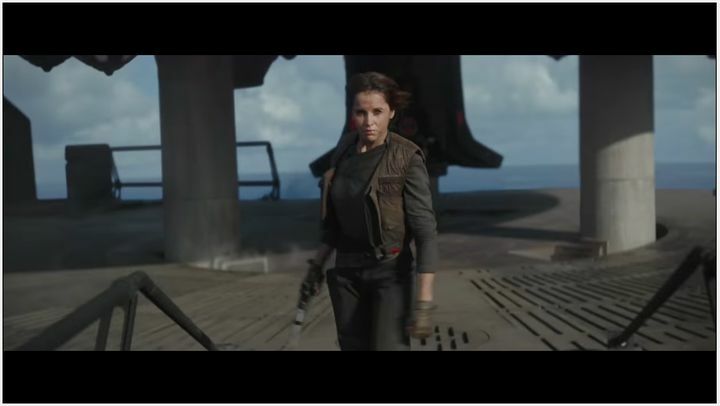 Like in earlier films, it looks like Rogue One will have its share of exciting action sequences too, and this trailer also shows the Rebel Alliance’s X-Wing fighters in action as they take out a huge AT-AT walker in one scene, and also go hunting the Empire’s Tie Fighters in the sort of space combat sequences Star Wars fans have gotten to love over the years.